Internal Control and Risk Management | Corporate Governance | About Us | NIKKISO CO., LTD.
Recognizing it as the important management issue to establish, maintain and operate a system in order to ensure that business may be executed in an appropriate manner, we have decided the "Internal Control Basic Policy" at the Board of Directors Meeting. 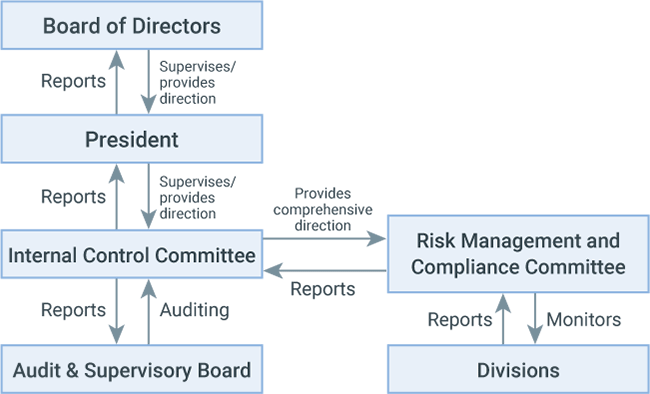 Our Group employs the following system of internal controls to ensure that we share the sound social ethics and values of a good corporate citizen, comply with laws, our Articles of Incorporation, and social norms, as well as build good relationships with our stakeholders in an aim to achieve sustainable growth and enhance our corporate value over the medium- to long-term. In an effort to ensure that our business is conducted in a transparent and fair manner, we also maintain a worldwide whistleblower system so employees can report any improper conduct to an external lawyer or other specialists. To specifically provide for the basic views that serve as the basis of compliance from a viewpoint in line with globalization of business and to share such views among the Nikkiso Group, we have established the "Nikkiso Group Global Code of Conduct" (hereinafter referred to as the "GCC"). The "GCC" is the highest level of standards with regard to the Nikkiso Group's compliance and provides for faithful business activities (fair competition, prevention of bribery, trade control, prohibition of insider trading, etc. ), protection of corporate assets and management of information (prohibition of transactions involving conflicts of interest, proper accounting reporting, information management, etc.) as well as respect for human rights and harmony with the environment (workplace health, environmental conservation, etc.). At Nikkiso, we make it a basic policy to have no relationships whatsoever with anti-social forces (or organized crime groups) and strongly reject any coercive demands by such groups. This basic policy is clearly incorporated into the board of directors-approved Internal Control Basic Policy. In order to ensure that this basic policy is implemented throughout the organization, all employees are provided with training along with a compliance handbook that spells out the specific rules of conduct they must follow so that everyone is aware of the policy. A department dedicated to eliminating influence by anti-social forces has been set up within the corporate division to address the issue across the organization. We also make a daily effort to gather information by working with the police and other related organizations to block any interaction with anti-social forces.